Twenty-five years ago, not only was the Berlin Wall breached, but also, by extension, was the Fence along the Inner German Border separating East Germany from West Germany rendered an anachronism. Even in the time after the (accidental) opening of travel from East to West Berlin, getting past the Fence wasn’t quite as easy as much of it was protected by land mines planted in the ground around it. I took this picture in 1979, 10 years before the beginning of the collapse of the Warsaw Pact. During my husband’s assignment to the American military community near Fulda, we lived about twelve miles away from “the fence.” Had there been hostilities, the front lines would have, again, overtaken the homes, gardens, driveways, farms and fields of ordinary people. 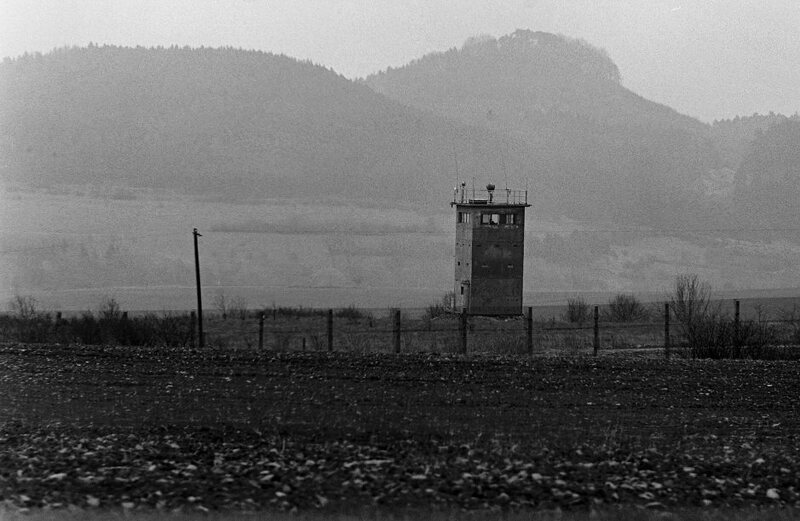 A view near Fulda of the inner-German-border fence constructed by the East German government. German article on how the deer herds that were separated during the years the Iron Curtain was in place still do not mingle with each other. Comments Off on Who Is Meinhof? is searching for breakfast at her new home/place of work. to keep both her and her new boss out of hot water. or the terrorists driving around the countryside?